Did you know that most accidents in the home happen in the kitchen? Vietnamese cooks know it. They have a constant reminder of the dangers they face as they prepare food for their families. A small altar to Tao Quan, the god of the hearth, takes pride of place in the Vietnamese kitchen. The story goes that Tao Quan burned his trousers by standing too close to the cooking fire. At each lunar new year, he will return to heaven to give a report on the family to the Emperor of Jade. In order to make sure that he gives a good report, the family will present him with gifts of fruit and a special ceremonial costume - without trousers. Traditionally - and even today in rural communities - most of the cooking was done over an open hearth. One member of the family was assigned to keep a watch on the flames to ensure they didn't go out. Food preparation was done on a wet tiled floor near the stove, where all the dishes and utensils were washed before being used. The cook would squat, legs curled under, on the floor. As modernisation encroaches and kitchens are evolving, fridges, sinks and worktops are being installed in many houses, but the cooking methods and styles remain largely traditional. The typical kitchen still doesn't have an oven and food is either cooked in a wok or claypot, or grilled over the open flame. Soups are made in a large pot, and because rice is such a vital part of the Vietnamese diet, a rice steamer will be found in every kitchen. Along with the wok, there'll be the usual accessories of a spatula and brush, plus a mortar and pestle, and a collection of knives, along with a thick wooden chopping board. One particular knife that may be found in a Vietnamese kitchen is one with a double-sided blade, used for creating decorative shapes from fruit and vegetables. 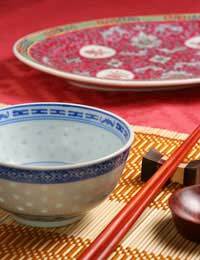 The Vietnamese diet is largely based on rice, fish and fresh vegetables. Little oil is used in the cooking; fish is gently cooked and lightly seasoned; vegetables are often served raw and salads are never over-dressed. Typical desserts involve fresh fruit and home-made yogurt. During the Period 1940 -1980, Vietnam was a troubled country and food shortages were common. It was hard to get enough rice to keep a family fed. But from about the mid-1980s, peace and the return of many who'd fled the country led gradually to an upturn in its fortunes. Food, good traditional Vietnamese food, was on the menu again. Today it is being adapted to fit in with the new era, for example, leaner cuts of meat are being used. As today's chefs experiment, modern variations can be found on restaurant menus alongside old-fashioned favourites - but with a modern twist. So thit kho to (pork slowly simmered in a claypot), a dish of peasant origin, will be found in upmarket restaurants in Hanoi. Traditionally Vietnamese food has involved lengthy preparation and cooking processes. During the reign of Emperor Tu Duc (1848-1883) food served in the imperial palace was very grand. He was proud man and insisted that he would not eat the same food as the peasants. The land around Hue, where the imperial palace was situated was less diverse in its produce than other parts of the country so the emperor's chefs had to be very creative. There has lately been a resurgence of interest from Vietnamese chefs in dishes from that period, and some restaurants don't open until late in the day because of the time involved in preparing the food. But for those of us who want to try Vietnamese cooking at home, it doesn't have to be that time-consuming. With food processors and ingredients now more easily available, we too can enjoy the taste of Vietnam. Fish sauce, nuoc mam, is an essential ingredient and can be obtained in Asian supermarkets, as can dried rice papers that are used for a variety of rolls. To retain the distinct flavour that comes from grilling over an open hearth, use a wood or charcoal barbecue.